Meet the people behind Hagen-Renaker Pottery and enjoy their artistry as this book delves into a behind-the-scenes look at this unique and creative company that has produced fine ceramics since 1946. 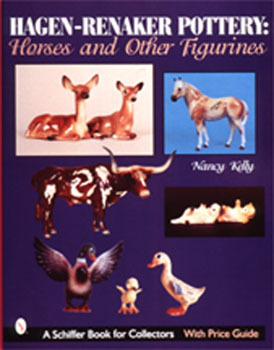 Realistic and whimsical clay animal figurines are featured in over 480 beautiful color photos creations from Hagen-Renaker. Horses, dogs, frogs, ducks, and more are professionally crafted by the company's talented artists. Highly valued as collectibles, these charming figures were made to be admired. A price guide, information on other potteries of the time, and a look at some Hagen-Renaker imitations are included.